The English Department aims to inculcate the love for reading and a thirst for knowledge in pupils by exposing them to a buffet of reading materials and genres. For the Lower Primary pupils, ‘Key Links’ titles are used to expose them to every link in the literacy chain. Guided Reading, an approach whereby pupils are grouped to read according to their reading stage, is used in the classroom. In a guided reading group, pupils are prompted to apply literacy skills and strategies that they have been introduced to through Shared Reading or other literacy experiences. Using the responses made by the pupils, the teacher is able to assess whether they are able to use appropriate literacy skills and strategies. More information can be found at http://keylinks.com.au/. 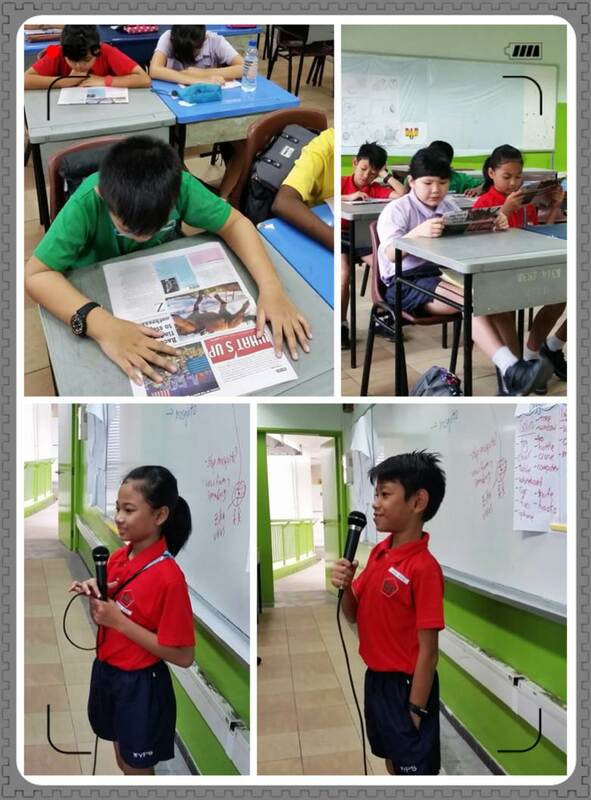 As part of our efforts to encourage our Upper Primary pupils to stay informed about current affairs in this volatile world, they subscribe to the monthly What’s Up newspaper. Based on the news articles, discussions are held during English lessons to allow pupils to share their personal responses. In this way, not only do they get to expand their world knowledge, they are also given opportunities to express themselves and work towards being confident users and speakers of the English Language. Pupils are also exposed to a wide variety of books through the IREAD programme. IREAD allows pupils to select and enjoy books of their choice, allowing them to read at their own comfortable pace. This promotes a healthy devotion to reading. A variety of activities such as book sharing and reviews will be carried out during English lessons to further encourage pupils to hone their speaking and writing skills through reading. Pupils were engaged in the reading of What’s Up newspaper and they shared their thoughts about the articles.